def shepherd: What Is Tolerance? November 16 is International Day of Tolerance. The UN General Assembly invited UN Member States to hold the day for observance, with the goal of advancing "human welfare, freedom and progress everywhere, as well as to encourage tolerance, respect, dialogue and cooperation among different cultures, civilizations and peoples." I once stumbled across the UN's Declaration on Principles on Tolerance. It's probably as fine a document as you will find on the subject. Many of us have certainly run into a scenario in which we have been called 'intolerant' for denouncing the beliefs of others. If one is self-aware, such an accusation does not fall on deaf ears. Progressives are often pointing out the hypocrisy in others as a means of highlighting the need for reflection or reform. It would make sense that accusations of hypocrisy and intolerance would give pause to one who is combating intolerance. The UN's declaration addresses this issue, and does a great job of explaining that tolerance does not require that one be tolerant of social injustice. This is where the rubber meets the road. When we denounce beliefs which cause harm to others, we are in no way in conflict with the concept of tolerance. Tolerance, in part, is "the responsibility that upholds human rights, pluralism (including cultural pluralism), democracy and the rule of law. It involves the rejection of dogmatism and absolutism and affirms the standards set out in international human rights instruments...The practice of tolerance does not mean toleration of social injustice or the abandonment or weakening of one's convictions." It wouldn't hurt us to give more attention to this day. 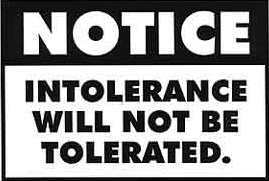 There sure seems to be a lot of confusion as to what tolerance really means. 2.4 Intolerance may take the form of marginalization of vulnerable groups and their exclusion from social and political participation, as well as violence and discrimination against them. As confirmed in the Declaration on Race and Racial Prejudice, "All individuals and groups have the right to be different" (Article 1.2).